The new ridesharing apps like Uber and Lyft are life-savers; and even pocket-savers when compared to taxi services from airport to the city. Most of the times these ridesharing apps can save you up to 50%, and the best part is the whole system is cashless. You don’t need to pay anything to the driver, and don’t spend that extra cash in tips. Most cities in U.S. and world have accepted ridesharing as the best way for transportation, but mainly because of the fees that taxi drivers pay to the airport, these apps won’t allow pickups at airports. As some Uber drivers told me that they are free to drop passengers off at the airport, but are not allowed to pick up people from the airport (although it does depend on the city you live in, as some cities do allow it now). So how do you work your way around this? One way is to take the free rental car shuttle out of the airport to the car rental company’s office, and then call for Uber or Lyft from there. This also depends on the city you’re arriving at. For example, car rental pickup lots in Los Angeles are far outside the airport and hence can hail Uber or Lyft. But if the offices are closeby then you may be out of luck. Second option is to take the shuttle buses of hotels that are close to the airport, wait at the lobby while you request a Uber or Lyft ride. Remember that a lot of these shuttle buses ask for reservations before getting in them. But you can tell the driver of the shuttle that you are a potential customer to the hotel and they will let you in. 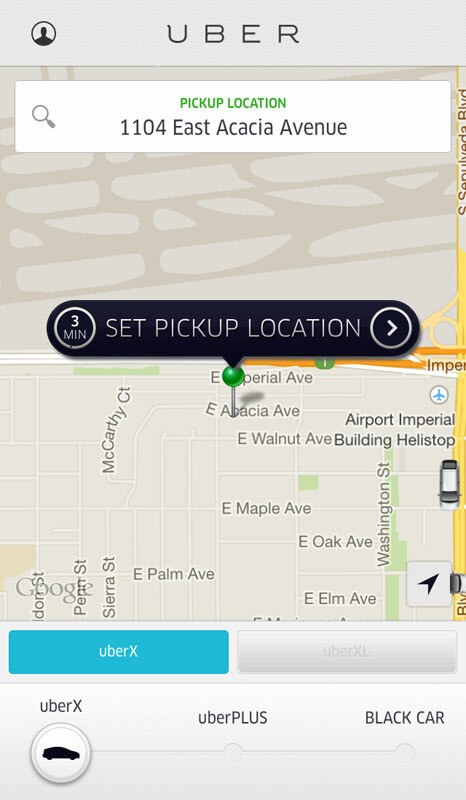 This is the most effective way of requesting an Uber ride from the airport itself. Uber and Lyft allow you to drag the pin on their app that determines your pickup location, all you have to do is simply try dragging the pin to the street outside of airport and dropped it to see if it would then allow you to request an UberX ride. Once accepted by the driver, just call them and tell them you want to be picked up from the terminal at the airport. This may not always work, because Uber drivers are reminded not to pick up passengers from airport else face fine or perhaps arrest. There are reports of minders being set at the airport to keep an eye for these scenarios and catch your driver. So there are chances your driver may decline that request in which case you can try the above mentioned options. Have you had any experience picking up or getting picked up from the airport? Share your comments and/or feedback.